Up to this point, RedOne has worked mostly behind-the-scenes, writing & producing hits for other artists. However, this Moroccan-Swedish musician is now stepping into the spotlight as an artist. He has signed with Warner Bros. Records, and he has just released his debut single, “Don’t You Need Somebody.” This song features vocal performances by Enrique Iglesias, R. City, Shaggy & Serayah. In addition, RedOne has filmed a video of “Don’t You Need Somebody” which includes these artists, plus many celebrity friends such as Jennifer Lopez, Ryan Seacrest, Cristiano Ronaldo, Rafael Nadal, Jean-Claude Van Damme, Akon, Randy Jackson, Perez Hilton and The Band Perry. We are pleased to do a new interview with RedOne, about his new career as an artist, and how he wrote & produced his earlier hits. But before we start the interview, here is some background information on RedOne’s career as a songwriter & producer. It was in 2007 that RedOne moved to the U.S., and his first American success happened when he co-wrote & produced the song “Whine Up” for Kat DeLuna on Epic Records. “Whine Up” was released as a single and became a Top 30 hit, and RedOne produced her album, 9 Lives. 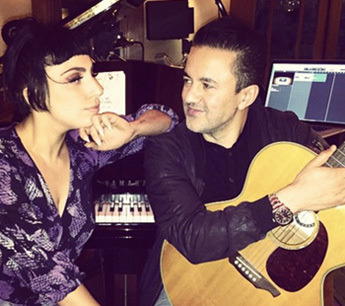 In addition to his work with Lady Gaga, RedOne has demonstrated his hit-making touch with other artists. He’s written & produced other top hits such as “On The Floor” and “Dance Again” (for Jennifer Lopez), “I Like It” (Enrique Iglesias featuring Pitbull), “Starships” and “Pound The Alarm” (Nicki Minaj), “Live My Life” (Far East Movement featuring Justin Bieber), and “Rain Over Me” (Pitbull featuring Marc Anthony). Here’s the video of RedOne’s new single “Don’t You Need Somebody.”. 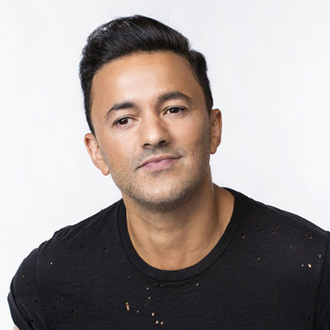 RedOne has also worked with a wide range of other artists, including U2, Michael Jackson, One Direction, Usher, Jason Derulo, Selena Gomez, Mary J. Blige, Cher, Lionel Richie, Taio Cruz, Backstreet Boys, New Kids On The Block, Sean Kingston, Kelly Rowland, Paulina Rubio, Lil Wayne and Nicole Scherzinger. Besides writing & producing, RedOne also develops new artists and songwriters; he started his own record label and music publishing company. RedOne is managed by Alan Melina & Jr. Regisford of New Heights Entertainment. DK: You’ve had great hit success as a writer & producer. What made you decide to become an artist? RedOne: I loved being a writer/producer (for other artists), because it’s enabled me to work with artists in all different genres. I initially thought, to be a performer, you had to stick to a single sound, and I loved too many kinds of music to do that. But now I find myself wanting to get back to singing and playing, and friends like Enrique (Iglesias) have encouraged me to do so. DK: When you’re writing a song for yourself as the artist, is it different than writing for other artists? RedOne: Well, to be honest with you, I am a music lover. When I’m writing, I always write like a fan. I just love writing great music. The songs all feel like my babies. So whether it’s for me or for somebody else, I have the same love for them. When I write for other artists, I do write specifically for the artist I’m working with—working with their identity, with their styles, to combine my musicality with them. When it comes to writing for myself, I do what I like, but at the same time in this situation with “Don’t You Need Somebody,” I have Enrique with me, I have Shaggy—global artists. And of course, because that’s what I am anyway (a global artist), it just fits perfectly with who I am. So it’s kind of the same thing. DK: Will you be putting out a full album for Warner Bros.? RedOne: Our focus at first is on delivering singles—global hits. And when I feel that the demand is there, then [I hope to] bring an incredible album to the world. DK: I read that you like creating music which has a positive energy and a positive message. Is that true? RedOne: To me, melodies are the universal language. Whether you understand a specific language or not, you will feel something (when you hear the music). So the way I write my melodies and my music, is that my music always has that positive energy. It’s something that’s engaging—they can feel something special, that makes you want to either dance or scream or jump or sing along together with people. I think the world more than ever needs that, and it just fits to my personality . [I believe] the world needs to be together and feel good, and that’s what I love trying to do with my music. DK: I really like your video for “Don’t You Need Somebody.” It not only has the featured singers, but it has cameos from many other celebrities. You have a lot of friends. RedOne: Thank you, I’m very happy about the video. There’s many different people in the video—there’s musicians, athletes, actors—it’s all my friends, and I really appreciate everything they’ve done. When you need your friends, you know who your friends are. A lot of them came through for me and appeared in the video, so it means a lot to me. DK: On the songs you record as an artist, will you be doing much of the singing? RedOne: You know, I actually sing…I sing pretty well. So you’ll hear me singing more on my future singles. But on “Don’t You Need Somebody, I just sing the chorus—I gave the verses to Enrique and the other artists. DK: Your single “Don’t You Need Somebody” was just released a few weeks ago, and has already gotten a good response. RedOne: I’m very excited about the reaction for “Don’t You Need Somebody.” It’s already getting a great response in different countries like Spain, Sweden, France, America and Southeast Asia. I’m very happy and thankful, and I’m looking forward to seeing what happens. DK: You’ve had a lot of hits writing & producing for other artists, and you’re known for your success with Lady Gaga. How did you get together with her? RedOne: I met Gaga when she was in the middle of changing labels. I met her, and immediately liked her as an artist and as a writer. She would go with me—I would take her with me on every session that I had, as a writer, because I loved the way she was writing. The next thing we did was, we got together and did a week of writing—it was like unbelievable…it was magic. We did all the number one records (“Just Dance,” “Poker Face,” “LoveGame’) in a week. After that, everything that happened became much, much bigger. It was beautiful…just incredible. DK: Did you create the tracks and production, and did she write most of the melody and lyrics? RedOne: No, I am a melody person. Of course I do the tracks as the producer, but I also wrote a lot of the melodies with her. I mainly wrote the melodies and tracks. And sometimes I helped with the lyrics. DK: I also loved your big hit “On The Floor,” which you did with Jennifer Lopez. How did this song happen? RedOne: I remembered that I was called to work with J-Lo—I’ve always been a big fan. I asked to have a meeting with her first, and then we met and we really liked each other. At the time, I already had “On The Floor” in my computer for like two years. I’d been waiting for the right artist to record this song. The song was mainly done by me and one of my writers, Kinda. I always felt the song could be a hit—we were just waiting for the right artist and opportunity. J-Lo was absolutely the right person for this song. So we did the song, and people loved it and it became a (worldwide) hit. DK: You also had some big hits with Nicki Minaj. How did you work with Nicki and create the hits “Starships” and “Pound The Alarm”? RedOne: With “Starships” and “Pound The Alarm,” I was in Europe and it was in December, right before Christmas. I was happy that Nicki called me. She said, “I need hits…global hits.” She’d already had hits in America, but she wanted to go global. I sent her the songs the day after Christmas. And before New Year’s, we were in the studio working together. It was incredible. I remember that “Starships” was different—a lot of people said it was different for her. You know, I think that’s what made it more special. It was giving her something different that she could take to the next level. It turned out to be the right song for her. She heard the song and said she loved it. She just did it quick; we recorded it, and Boom.